BusinessPro Designs is an ISO 9001:2008 certified organization adhering to the best practices of software engineering processes for the successful delivery as per the approved scope of work order. BusinessPro Designs strives for ontime quality solutions to our esteemed customers through continuous improvement process. We have well defined procedures in controlled environment to continuously track, evaluate and assimilate all the software engineering’s works. We believe that if software engineering processes are adhered right from the start of the projects to the final delivery of the projects, the output delivered would be the required quality parameters for all deliverables thereby increasing the customer’s satisfaction and increased business revenue to BusinessPro Designs. The businesses acquired are first recorded into the internal portal of Customer relationship management (CRM) where all approved work orders from the perspective customers are stored in the centralized repository. For each approved work orders, dedicated account managers are assigned where they act as a bridge between the internal software engineer’s team and the customer in place. The approved work orders are then handed over to the respective project managers where the work orders are then translated into actual software engineering’s work. For each approved work order, software designs are developed and sent for review to the customers. On approval of the designs from the customers, the actual programming is implemented on the software designs. The actual programming is then sent for customers review so that the customers are well aware of the fact that the project developed is as per their approved work order. The BusinessPro Designs also takes care of any enhancements or any changes that may happen during the full software development life cycle. 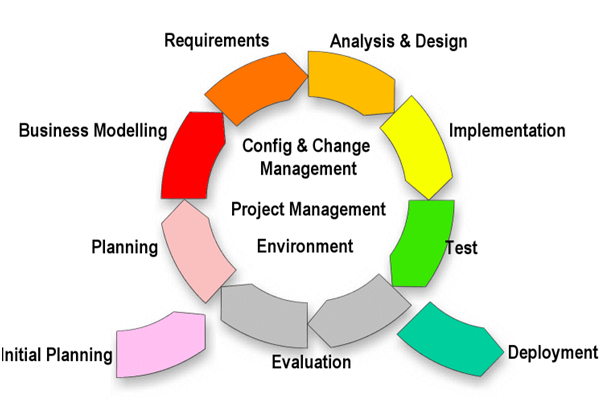 All enhancements/changes follow the configuration management life cycle where the configuration/ changes items are first analysed, risks associated are evaluated and the timeline and budgets accordingly analysed in details. The configuration items are then reported to the customers and an approval taken on the business and technical decisions taken by BusinessPro designs before its implementation. The configurations items are accordingly then integrated with the current software development life.